(LĪHU‘E) – Eight students graduated from the Kaua‘i Police Department’s second Junior Police Academy class on Saturday, Jan. 5, at a ceremony held in the courtyard of Ka Hale Maka‘i o Kaua‘i, Police Headquarters. 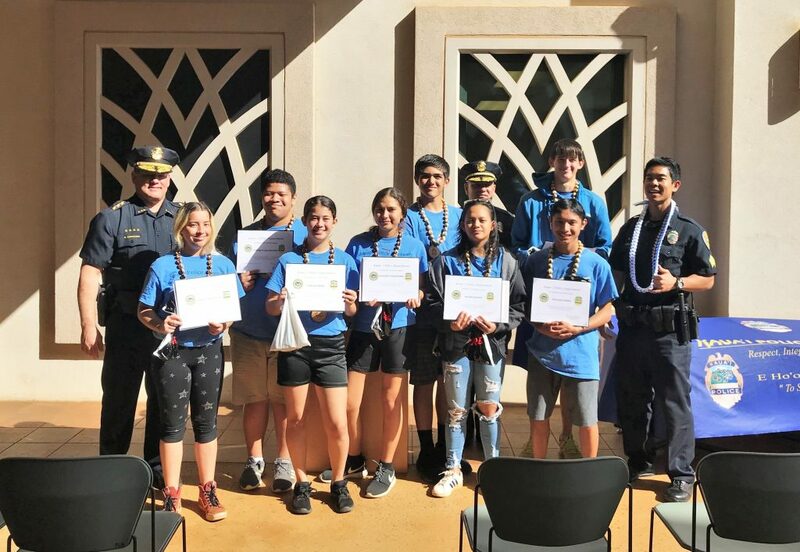 The high school students were honored with a lei and a certificate, marking their completion of the eight-day training program held from December 26, 2018 through January 5, 2019. The following students graduated on Saturday: William Andres, Sassaley “Sas” Aviguetero, Stephan “Kulani” Callion-Nizo, Joel Hedstrom, Mandie Manuel, Storm Orsatelli, Kailani Reyes, and Cameron Whittenburg. 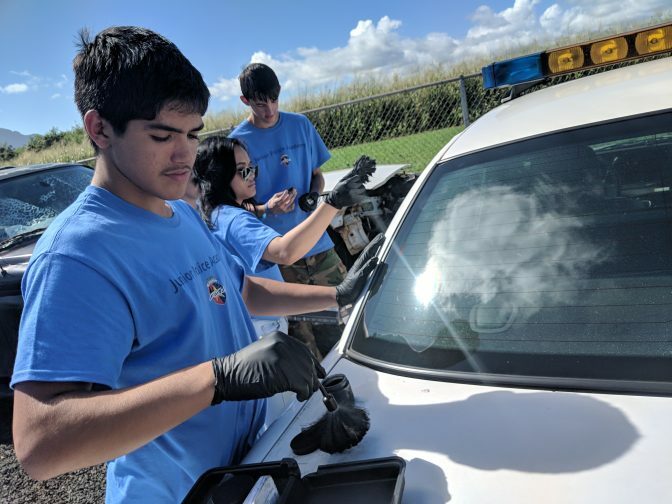 KPD’s Junior Police Academy is a program under the Kaua‘i Police Activities League (K-PAL) designed to introduce students to police operations and law enforcement functions through both classroom and field instruction. The curriculum includes instruction on the criminal justice system, crime scene investigations, evidence collection, forensics, Segway training, SafeTALK training on suicide prevention, firearms safety, alcohol awareness, first-aid CPR and AED, ALICE civilian active shooter response training, physical fitness, use of force, and bike patrol. The program serves as an introductory course to KPD’s Explorer Program, which provides young adults ages 14 through 20 an opportunity to explore a career in law enforcement. The next class for KPD’s Junior Police Academy has not yet been scheduled, however the department anticipates it will be offered at the start of summer. Details will be announced as more information becomes available. For more information on KPD’s Junior Police Academy, call Sgt. Lance Okasaki at 241-1647.